Made in USA with an aggressive look the mustang gets Stance! BMR springs are made from chrome silicon high-tensile spring wire, and are cold wound on a CNC coiling machine. Every BMR spring is compressed solid at the factory and stress-relieved at 750 degrees F. BMR offers a LIFETIME WARRANTY against spring sag. Blending aesthetics and performance, BMR has designed the SP080 for the street performance crowd who want to use their cars in a variety of application. These springs will lower your S550, and feature a fine-tuned spring rate to give you great handling and a smooth ride. The linear spring rate offers plenty of support, keeping the body flat and level in the corners, while remaining soft enough for a comfortable ride on any road. When performance and looks are a must, rely on BMR Suspension! BMR SP080 lowering springs are available in red powdercoat. Installation time 2-3 hours. Made in the U.S.A. Lowering the center of gravity not only provides visual appeal, it also dramatically improves the handling ability of your Mustang. BMR lowering springs are specifically designed to provide optimal handling without sacrificing ride quality. Our extensive development time produced what we feel to be the optimal rates for this application. 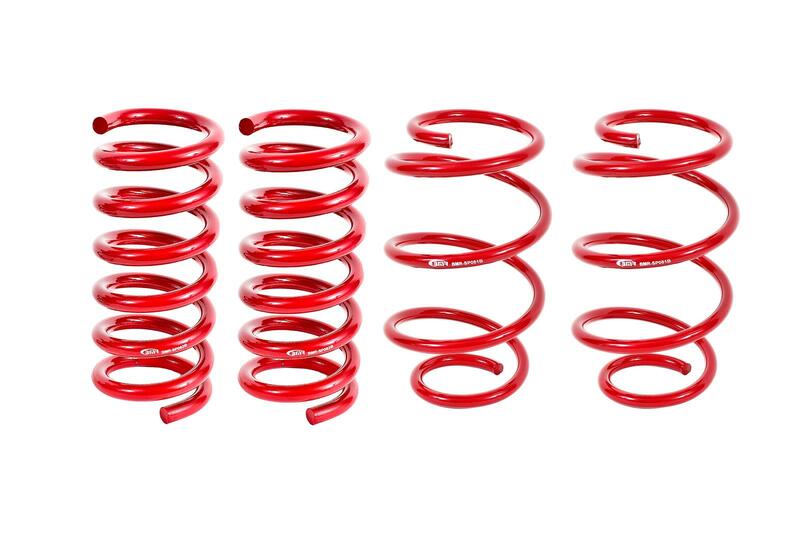 By using a 170lb/in Spring Rate Front spring and a 740lb/in Spring Rate - Rear spring the car responds with a firm yet comfortable ride with much improved handling characteristics. All BMR springs are cold wound from high-tensile chrome silicon wire, stress relieved, compressed for permanent set then shot peened and computer tested. Some of these procedures are overkill but it ensures a long, trouble-free life with consistent rates and ride heights. Because of these features, BMR is able to offer a lifetime warranty against spring sag.